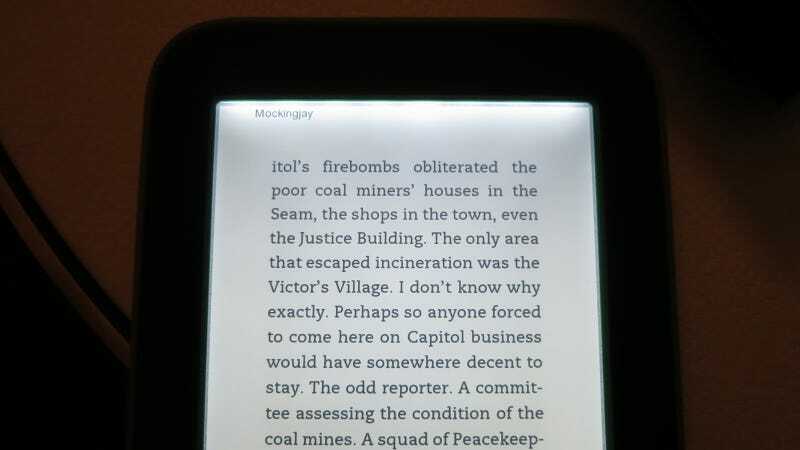 The Nook Simple Touch was already the best ereader out there. And it just took the last step for an ereader to become the only book-reading gadget you need. Now—thanks to a new frontlit display—you can read in the dark. The frontlight is obviously the biggest feature here, and it's pretty impressive. It's turned on and off by holding down the front button for two seconds, and there's a convenient slider in the menu to adjust the brightness. In a mostly but not totally dark room, the lowest brightness setting was enough to read with, but at full bore the GlowLight gets almost as bright as an iPad. The LED frontlight is housed entirely in the bezel at the top of the page. It's conducted (mostly) evenly throughout the rest of the screen by a material Barnes & Noble's keeping under wraps—"not glass" they told me. The treatment that the surface of the page gets also doubles as a screen protector. B&N says that it'll be much more resistant to scuffs and scrapes than the older models. Battery life, which is a large deal for ereaders, is rated at a month if you read for 30 minutes a day—with the frontlight on. That's about half the life the old Simple Touch, or an unlit GlowLight model, gets without a frontlight. And maybe most impressively, the improvements don't add any extra heft. The frontlit Nook is the exact same dimensions as the old Nook, and 5 percent lighter. That doesn't sound like much, but it's absolutely noticeable. The drawback is that adding an extra layer (for the light) between the ink and the surface means there's a slight loss of contrast between the print and the page. That's just physics. It's not super noticeable in the dark with the front light on, but out in the sun or in a well lit room, you'll notice it if you look closely. The screen also deflects glare in the sun a little less effectively than the old Simple Touch. But it's pretty negligible—a B&N rep confirmed, but I had to stare at both models for a few minutes under a very bright sun to see it myself. For all the promising bits about it, there are two nitpicky-but-really-ugh things that stand out. One, the grey band around the rim of the reader. The original Simple Touch was a beautiful piece of ergonomic, matte design. The GlowLight is too, just with a garish ring around it. Ugh. The other thing is the name. God, that name. Nook Simple Touch was bad enough—it's simple to use—but just tacking on "with GlowLight" is insane. It sounds idiotic. What's wrong with just calling it the Nook, or Nook Touch, or Nook Night, or anything that isn't miserable and clunky and gahhh? All that said, though, the Nook Simple Touch with GlowLight new Nook is $139—the same price as the no-ads Kindle Touch—and goes up for pre-sale today, with an "early May" ship date.